Without one the automatic location where files are saved will be the Movies folder on the computer you are working on which will not be accessible from other machines if someone else is using that particular machine. Connect an external hard drive to the Mac with a USB cable. Click “Don’t Use” if a message asks to use drive with Time Machine. 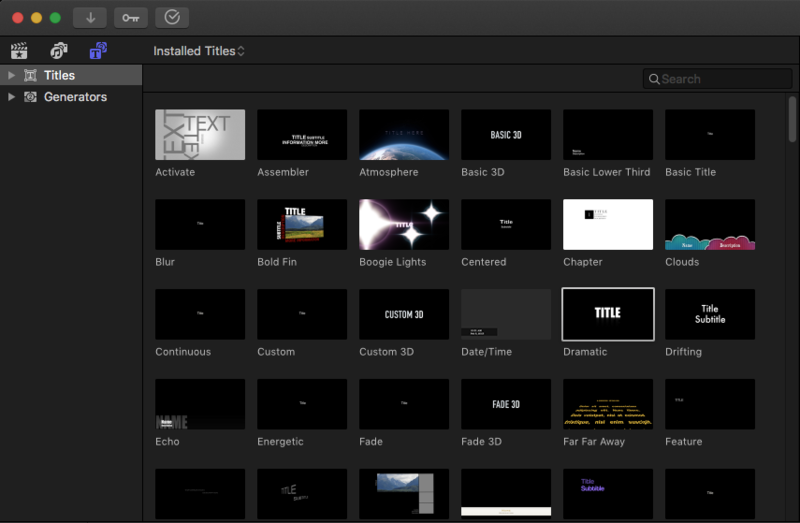 Open Final Cut Pro X by going to the dock and then click on “Final Cut Pro”. If Final Cut Pro is not in the dock, click the finder and go to the applications folder. To setup your project on the hard drive go to “File” then “New” then “Library”. Choose a name to save your project file as and under the where dropdown box select the DMS hard drive # and click save. You may have to browse to the hard drive on the column on the left in the Finder. 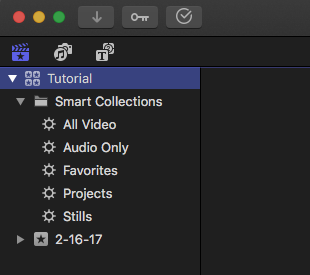 The new “Library” is created in the top left corner of Final Cut. Here I called it Tutorial. The tab under the “Library” is where all of your imported clips get stored in folders called “Events”. It’s a good idea to change the name of your events because the default is today's date. Here the default events folder was 2/16/17. To change the name, click on the folder once and wait about 1 second until the text is highlighted. The Smart Collections folder folder sorts your content by: video, audio, favorites, projects, and stills. Next it’s time to create a timeline. Go to “File” then “New” then “Project”. Give the “Project” a name and make sure the project is saving under the correct “Event”. Then click “OK”. The default automatic setting will set the timeline based on the first video clip you add. It's best to choose the setting yourself if you are mixing media from other sources. If you know the settings your camera uses you can adjust by clicking “Use Custom Settings”. 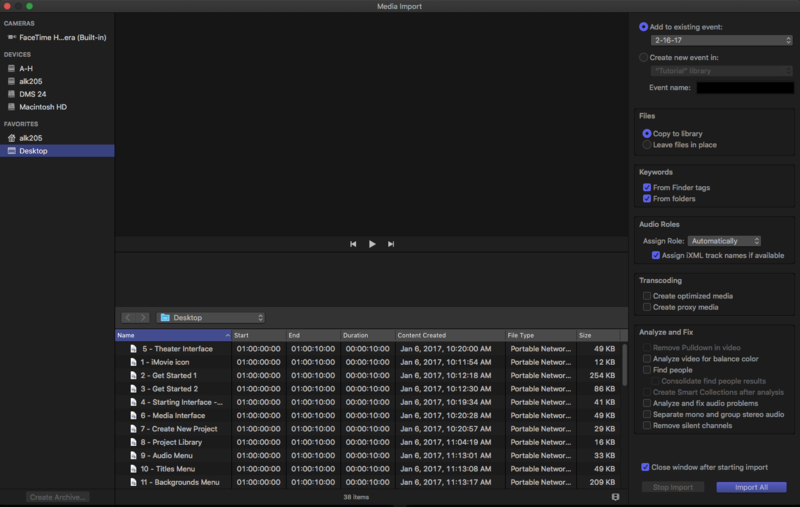 Note: Final Cut Pro X will automatically save your work after every move you make. There is no file then save option. 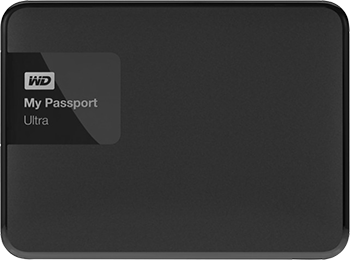 *When returning a hard drive please ask the DMS staff about backing up your work. Import clips from the camcorder. Connect your camcorder to the computer using the mini usb cable. The USB connection is on the back of the monitor and the mini usb connection for the camera is on the bottom right side behind a plastic cover. 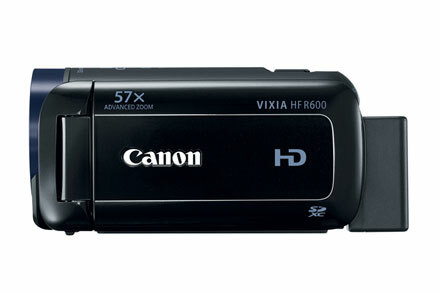 •	Power on the camcorder and press the playback button on the side of the camera behind the LCD screen. •	On the touch panel choose connect to computer/printer. •	Make sure you Add to the existing event you named in step #4. •	Leave all defaults in place including copy files to library. •	Close the capture window when done. 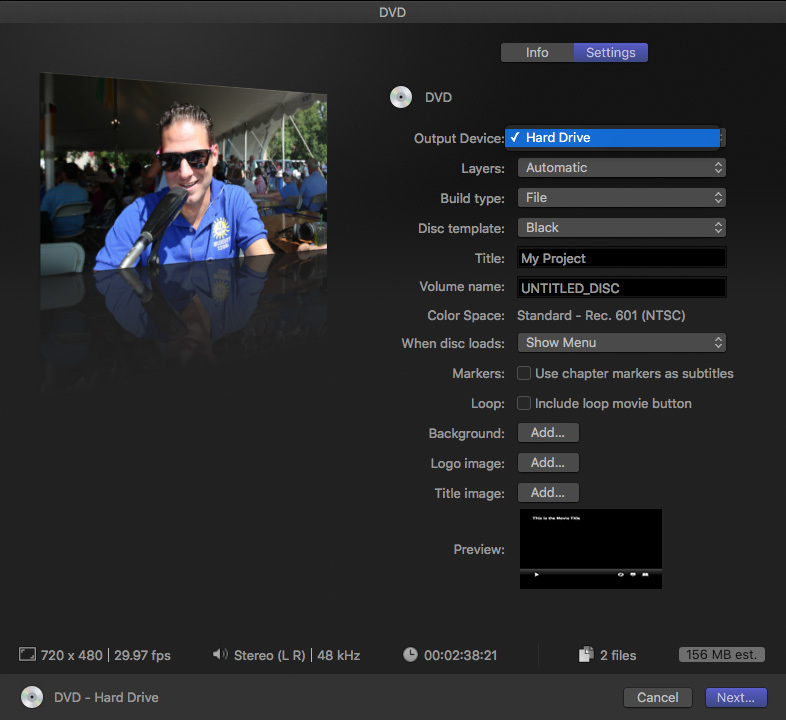 To import additional video, pictures, and audio files from other locations such as the desktop go to “File” then “Import → Media”. You can add them to an existing event or create a new event. You can choose to import all from a folder or select individual clips. Make sure the box is checked for copy files to library (unless the files are already on the hard drive). 1. Library: this is where your clips are stored. 2. 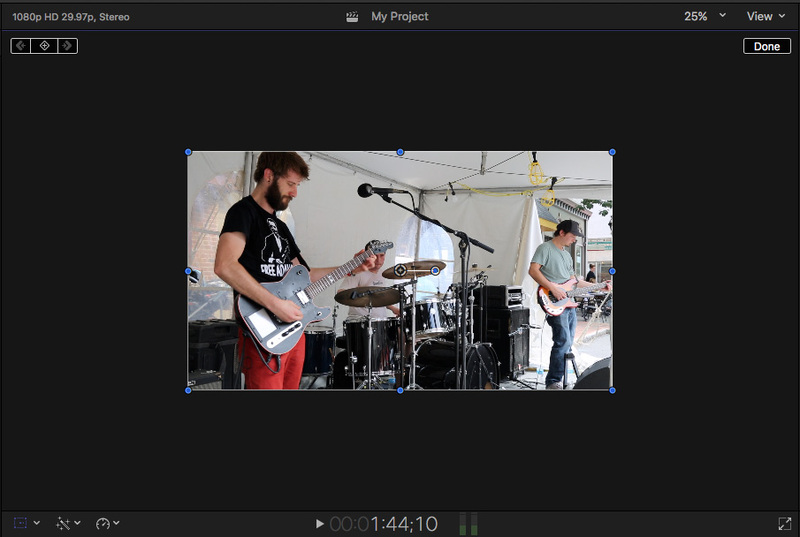 Canvas: this window previews your video from the library or the timeline. 3. Timeline: this is where you edit and build your movie. 4. Tools: Contain tools for selecting, trimming, cutting clips, and manipulating the timeline. 5. 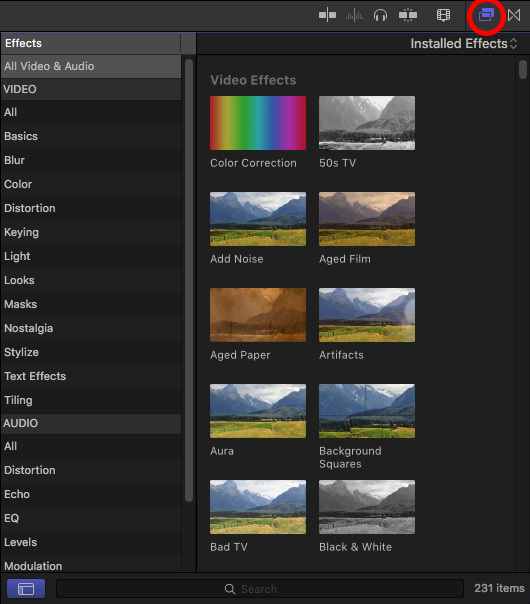 Effects: This menu contains video filters, effects, audio effects, and the green screen key. 6. 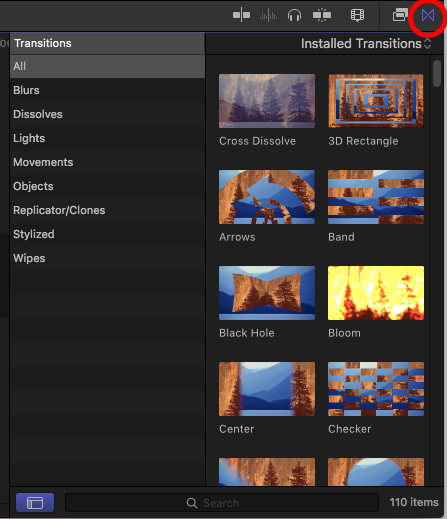 Transitions: This menu contains video transitions, which are smoother ways to blend one clip into the next vs a jump cut (cutting from one clip to the next). 7. Titles: This is the titles menu. It has contains over 80 presets titles. 8. 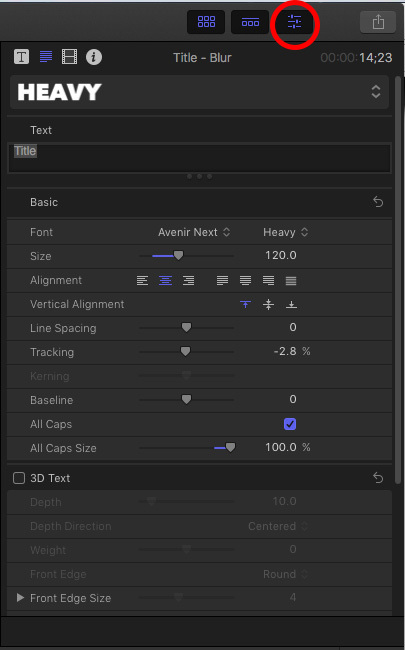 Inspector: This menu allows you to change options such as, scale, opacity, crop, color balance, audio levels, and text font, style, size, and color. Mouse over and highlight a clip in the browser and drag and drop it into the primary storyline track (the dark gray area) of your timeline. To move the clip around in the timeline, left click to pick it up and drag in to another spot. Clips will move out of the way when using the selection tool. When using the position tool you can overwrite parts of other clips. 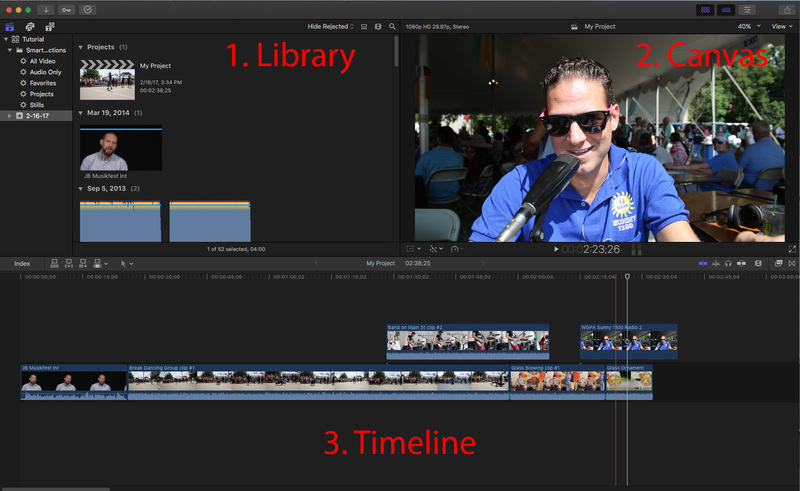 Before adding video your timeline you can trim the video to add one segment of the clip to the timeline. Highlight and select a clip and press spacebar to preview it. To trim the clip, highlight a specific section using the mouse. Only the part inside the yellow marquee box is selected. 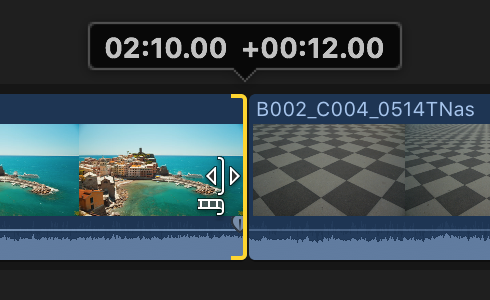 For those familiar with past versions of Final Cut you can use “I” for in and “o” for out to mark your in and out points. Mouse over the center of the selection and when you see the hand grabber tool appear its safe to drag and drop that selection into your timeline. Press spacebar to play video in the timeline. In the Canvas you can also press the play button. Notice the playhead marker (red arrowhead with a red vertical line) coming down from the top of the timeline. This indicates the exact frame you are on and should moved be to the left of the clip you wish to play. To move the playhead left click or left click and drag. To delete a clip in the timeline, highlight clip and press ‘delete’ or backspace key on the keyboard. This will close any gaps. If you use the small home ‘delete’ key located to the right of the backspace delete key then it leaves a gap with a blank video. With the selection tool (a) from the tool palette, highlight a clip in the timeline and left click and hold to move it around. Release to drop the clip. You can change the order of clips in the timeline using the selection tool. If you create a gap you can right click in that space and choose ‘close gap’. First make sure you turn snapping on in order to lock onto the playhead where you would like to make the cut. To turn snapping on press "N" on the keyboard. To split a clip, park the playhead at the desired cut point. Then from the tool palette select the razor blade tool (b). Move the mouse with the razor blade selected to the playhead over the video and it will snap too the line. Left click to perform the cut. To trim a clip, move the mouse to the front or back edge of a clip and when you see a symbol that looks like this (see pic). Click and drag to trim in either direction. Use the playhead as a guide to line up your trim point. The common transitions to use are cuts (default) fade in, fade out, and cross dissolve. 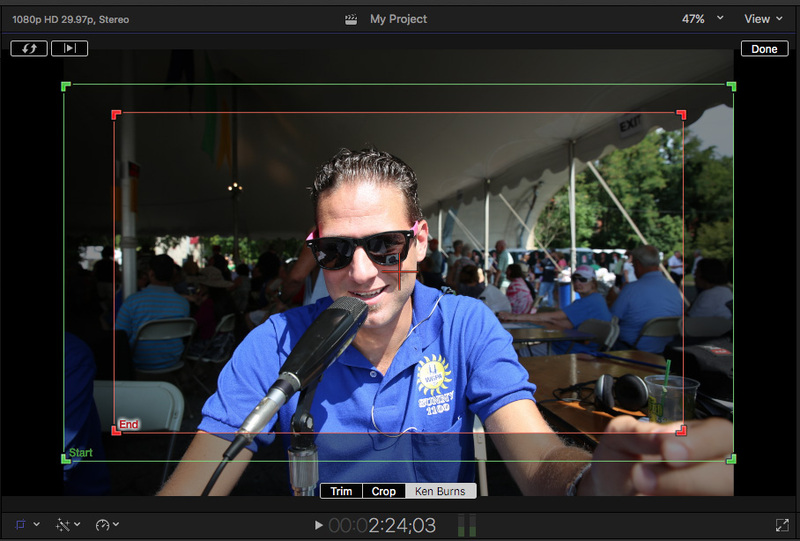 To add a transition simply drag and drop one between two clips or at the end of a clip. There are 110 built in transitions to choose from. You can extend or shrink the transition by the trimming the edge of the transition (). A cross dissolve will act as a fade in at the beginning of your movie or a fade out and the end (when your last clip is not connected to an adjacent clip). 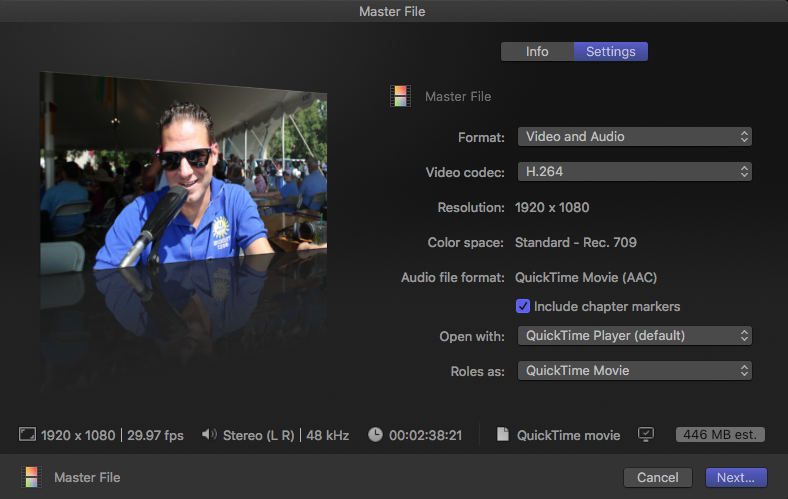 Video track 2 overrides video track 1 and is useful for adding b-roll while keeping your interview audio running in audio track below. Click on the "T" icon in the toolbar options above the library. Click on a title below to preview it. Too add a title on top of video in your movie drag and drop the title above a clip on the timeline. To add it over black video choose a blank space in your timeline. Once the title is in the timeline, highlight it then mouse over the text in the Canvas and double click to change the wording of the text. Once you are done, click on the clipboard icon to the left of the "T" icon to return to your media library view. Click on the ‘Inspector button' (circled button in the upper right corner of Final Cut Pro) to get more text options such as font, color, style and size. Import music files from ‘File’ then ‘Import’ then ‘Files’. Add to a new event or existing event. 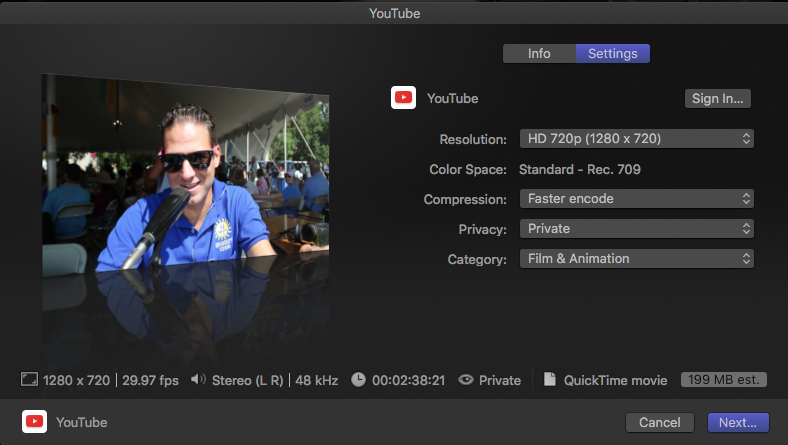 To move the audio into your timeline highlight the audio clip from the Event Library and drag and drop it below your primary storyline video track. 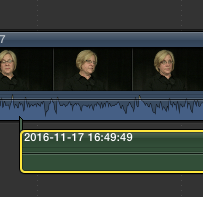 Audio can be trimmed with in and out points before adding it to the timeline (just like video). Audio tracks will appear in the timeline in a green color. Highlight an audio track in the timeline and left click and grab the line in the middle. You can raise it 12 decibels (12db) to increase the volume. To do an audio “fade in/fade out” grab the marker at the start of a clip and left-click and drag it to the right to add a (+3db) fade in. Right click on the marker to make it a linear or s-curve fade in. 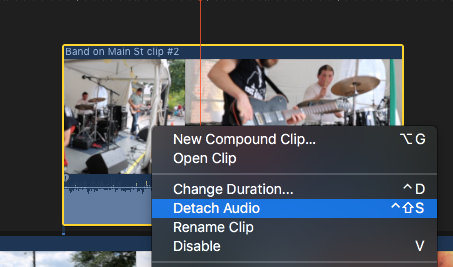 Right click on a video track in the timeline and choose “Detach audio”. This will drop the audio track below the primary storyline track. Now if you move the video track the audio track will not follow. Highlight the audio track and press delete to remove it. 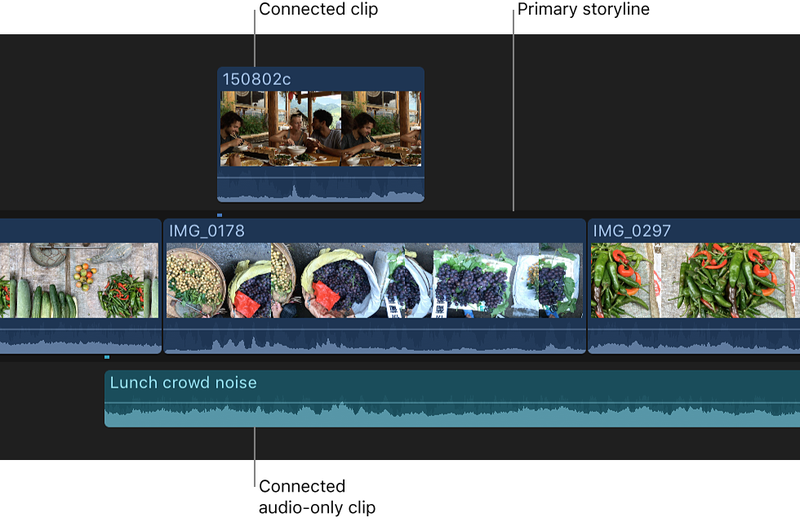 Clip connections automatically lock video placed above video track 2 to the primary storyline track 1. This is very useful if you move video track 1 around then track 2,3,4, etc will follow. Be careful deleting content on video track 1 though because any clips connected to the clip on track 1 will be deleted as well. 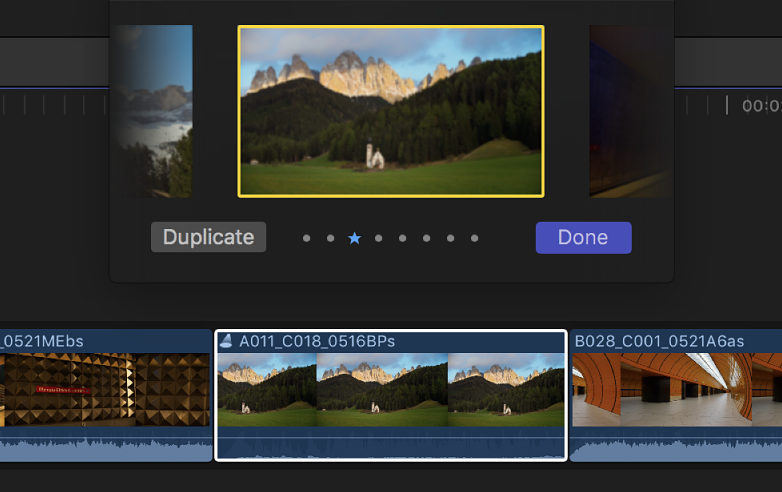 Clip auditioning is a new feature which allows you to place a bunch of clips inside of 1 clip in the timeline and quickly switch back and forth between the lot to determine which clip fits best. 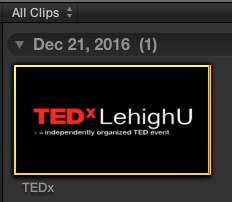 To do this, drag and drop a clip from the event library into another clip on the timeline (You should see a filmstrip icon appear). Then choose “Add clip to audition from the pop-up menu. Next click on the spotlight symbol that appears next to the Clip Title and the audition window will pop up. Here you easily switch between the different clips to sample how they look in that section of your movie. Click “Done” to finalize. Go to File’ then ‘Import’ → ‘Files’. You can add it a new event or existing event. Add still images to the timeline the same way you do video clips. Drag and drop the still image from the Event Library to the Timeline. Start by dragging and dropping a still image from the Event Library into the timeline. Highlight your picture then under the Canvas click on drop down button next to the Transform button and select Crop. Next click on the Ken Burns tab. Now you’ll see two rectangular widescreen boxes to represent the starting and end point of your Ken Burns motion. Just move the boxes around to control position and change their size to adjust scale. What you see in the box is how the image will be cropped in the frame. The arrow in the center indicates the direction in which the motion will occur within the frame. You can also apply motion using keyframes. First highlight the clip in the timeline and then click on the ‘Inspector’ tab (see step 23). From the Inspector window make sure the Video tab is selected (it's the film strip highlighted in blue). Then click on the “Show” link under Transform. The "Show" link drops down this menu which gives you the ability to set keyframes for position, rotation, and scale. The keyframe button is located to the right of each line. Next hit the grid button underneath the video which gives you handles on each side of your video to manipulate the scale and position. When it's highlighted in blue it will activate the handles. Just park the playhead over the top so you can manipulate it from the Canvas. Note: You may wish to scale out at the top of your Canvas so you can see the blue handles. Here I'm at 25%. Now back within the Canvas you can grab the border of your video clip to change scale, or grab the middle to control positioning, or the blue dot to the right of the middle to control rotation. Set the position for the first keyframe and click on the position keyframe in the inspector. Then move the playhead to a later part of the same clip and adjust the position for the 2nd keyframe. The 2nd keyframe will be created automatically after you create the first as it detects when a change is made. Scale and position keyframes need to be created separately. To jump between the keyframes you created use the arrow keys next to the keyframe button. To delete a keyframe hit the drop down arrow next to the keyframe button and choose “Delete Keyframe”. One of the last steps to finish your project may be to colorize it to give the video a consistent look. 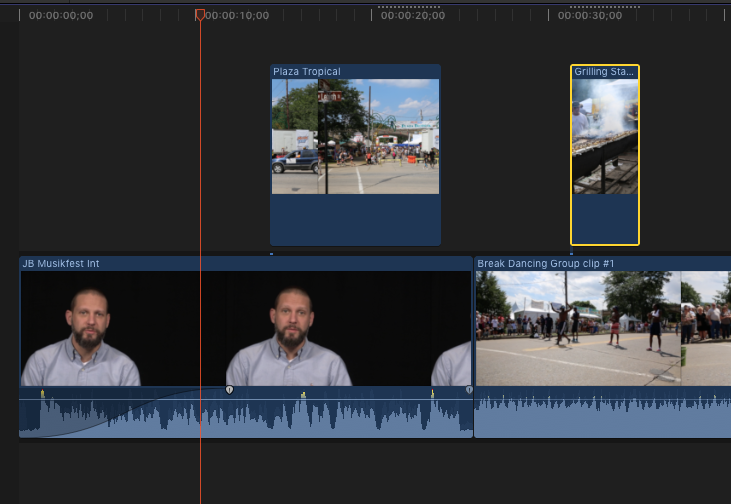 To add a video effect highlight a clip in the timeline then click the effects menu. Select an effect to preview how it will look. To apply the effect left click and drag it onto the clip in the timeline. Go to the top menu and click on “File” then “Share” then “DVD”. Next connect an external DVD drive and insert a blank DVD disc (DVD-R is most compatible). Output device: (make sure to choose the external drive) *not the hard drive option. Disc template: default (5 different backgrounds to choose from). Title: Enter title of disc for the main menu. Volume Name: How the disc title will read on a computer. Color Space: This is automatically set based on your timeline settings. When disc loads: either choose Show Menu or Play movie immediately. Markers: Checkbox to use chapter markers as subtitles. Loop: Checkbox creates a loop movie button. Background: Click "Add" to browse for a picture to add as the background to personalize your menu. Logo image: Click "Add" to create a logo. Title image: Click "Add" to create a title image. Click on “Window” then “Background Tasks” to view the overall completion percentage. The DVD should pop out of the external drive when its finished. Note: Ensemble file size must be below 12GB. Video length approx: 2 hours. Go to “File” then ‘Share’ at the top menu then ‘YouTube’ to directly upload the movie to your account. 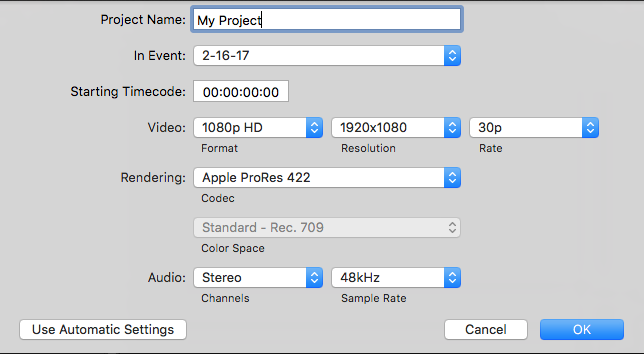 If you would like to create the file now and upload later then use the .H264 Ensemble setting (in step 44). Click “Next” to begin youtube upload.